WORK-READY: 2,000 lb. towing capacity, 1,500 lb. payload capacity, 1,000 lb. capacity cargo box with tilt, 3-person bench seating, column shifting adjustable driver seat, easy to service and upgrade. 1,000 LB. CAPACITY CARGO BOX WITH TILT: A truck-like bed makes it easy to load up, drop off and repeat. 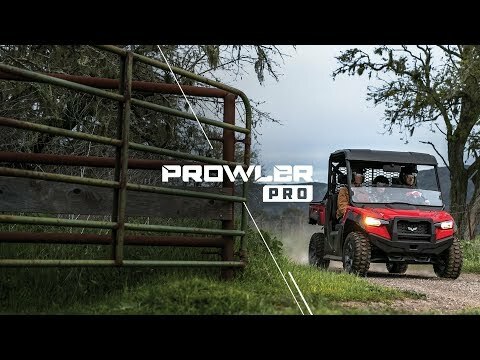 NEXT-LEVEL STORAGE: Prowler Pro was designed to help you carry everything you need for the road ahead, with plenty of built-in storage space. 17.95 cu. ft. of storage, 14.72 cu. 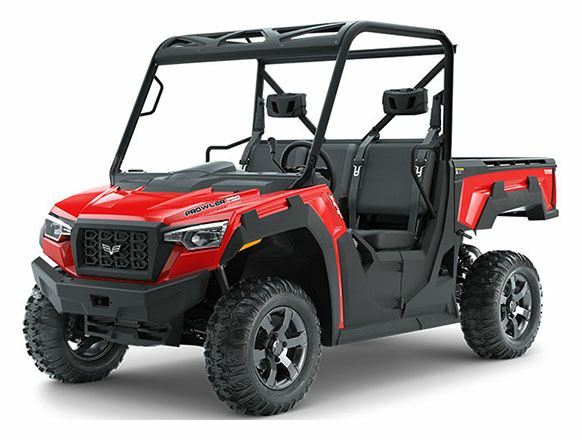 ft. cargo box, customizable modular design, multiple in-cab storage compartments, removable passenger seats, spacious glove box, behind-the-seat storage. SUSPENSION & HANDLING: 10 in. front and 9.5 in. rear suspension travel, 10.75 in. ground clearance, Pro-Terrain 26 in. front and rear tires, selectable locking rear differential, electronically selectable 4WD. RELIABILITY: Made in Thief River Falls, MN; built with Textron precision engineering and aggressively tested for over 1,000 hours.